When this tweet appeared in my twitter stream I thought it was a joke. Then upon further investigation it really wasn’t. 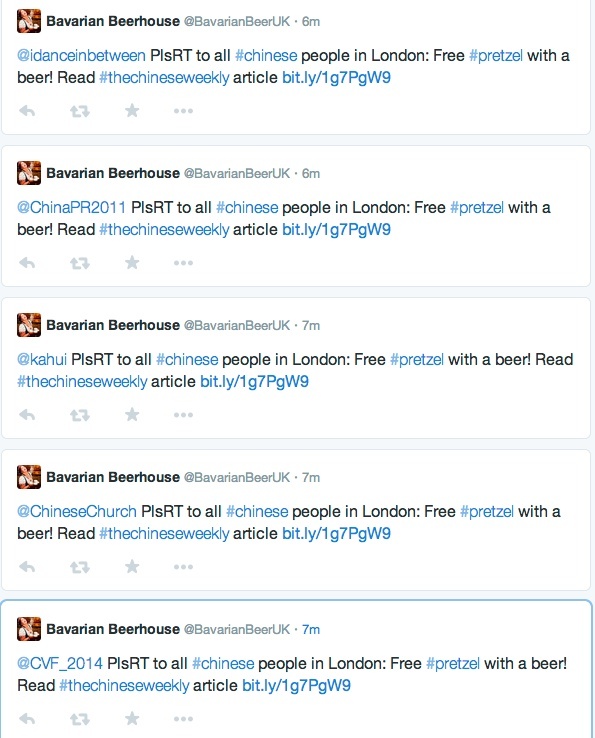 The barbarian beer house in London is after Chinese people to attend an event. And you can see they’re asking a lot of people who they presume are Chinese or have a Chinese audience. Aside form being borderline racist, it’s asking me to do something impossible – RT to my Chinese followers. How do I know which is my followers are Chinese? Do I search ‘London’ and ‘Chinese’ as terms as they have so clearly done in their marketing efforts? A little note to Barvarian beer house and any other establishment or agency who think they’re onto something with this little tactic: be careful. The lack of subtlety and blind assumption about peoples’ background on twitter will get you in trouble, make you lose more customers than the potential gain and, of course, garner all kinds of bad press.